The Polish Ministry of Economy says that there is no need to “differentiate between the territory of Morocco and that of Western Sahara”. However, such a position is inconsistent with international law and resolutions of the UN General Assembly adopted over the last 40 years, said representative of Western Sahara Resource Watch (WSRW). "The matter of bilateral economic cooperation and commercial exchange that remain within the authority of the Ministry of Economy does not differentiate between the territory of Morocco and Western Sahara”. Moreover, the Ministry sees no “need to differentiate between the territory of Morocco and Western Sahara” and in consequence it treats former Spanish Sahara as an integral part of the Moroccan state. This approach is inconsistent with the legal rights to self-determination which is valid also in the case of Western Sahara, the last colony in Africa. According to this rule those who must decide upon the status of a colonial territory are its inhabitants. In the case of Western Sahara, the United Nations has consistently supported such a right, and called for a self-determination referendum. The government of Morocco holds to the incorrect opinion that Western Sahara is something it simply has a right to, and does not intend to listen to the voices of the people of Western Sahara. “The Polish Ministry seems not to realize that Western Sahara is occupied by Morocco and in the light of international law is not a part of the Moroccan kingdom”, says Paweł Średziński from WSRW. “No one has recognized the Moroccan control over Western Sahara and therefore Morocco and Western Sahara should be treated as two separate territories, with Morocco being already a state and Western Sahara a Spanish colony that has not been decolonized yet”. Spain did not carry through the process of decolonization and on leaving Western Sahara over 30 years ago they gave it away to Morocco and Mauritania without asking the local people their opinion. By 1979 Mauritania had renounced its illegal occupation in a peace agreement with the Saharawi people, while Morocco has occupied the Western Sahara territory since 1975! The Ministry does not care also about the issue of the origin of the imported phosphates. In official foreign trade statistics, ministerial officials refer to only Morocco. It is nothing new that Western Sahara possesses one of the greatest deposits of phosphates in the world. Morocco in its occupation of Western Sahara uses the explored resources without having sought permission of the Saharawi people to do so. This is contradictory to the requirement to ensure the control of phosphates by the local people. The Ministry of Economy does not verify therefore whether phosphates exported by Morocco come from Western Sahara and whether the income from their extraction goes to the people of Western Sahara. "Poland as a country that declares commitment to the idea of freedom and that belongs to the European Union which promotes human rights is not interested in the rights of inhabitants of Western Sahara”, sums up Średziński. Whether the income from phosphates reinforces the Moroccan or Western Saharan pocket is of no interest to the Polish authorities. In the end, from the point of view of the Polish way of running politics, Morocco is a “more important” partner than Western Sahara. The Ministry of Economy does not, however, care about where phosphates come from to Poland. It is still unknown whether Polish companies will start exploratory and research work in Western Sahara. The Ministry says that so far such a situation has never taken place. 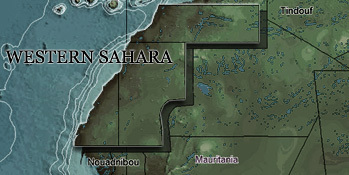 Nevertheless, since the Ministry does not want to differentiate between the territory of Western Sahara and Morocco, and in July 2009 Deputy Prime Minister Pawlak declared the willingness to tighten cooperation with Moroccan partners also in the area of searching and exploration this leads to the conclusion that what for the Ministry is Morocco likewise the territory of Western Sahara. The 27th of February was the anniversary of symbolic declaration of Western Sahara independence by the Polisario Front, a group fighting for a free Western Sahara. Despite 34 years that has passed, none of the Western countries that care so much about respecting human rights has done anything – except for Sweden – to help in solving the Western Saharan conflict. Poland, like other European Union countries, keeps quiet about Western Sahara. The stated policy of Ministry of Economy reveals who and what is important. For Poland, it seems that is not human rights and the rule of international law.